To make the pancakes mix together the flour, baking powder and a pinch of salt in a large bowl. Lightly beat the egg together with the milk. Make a well in the centre of the flour and slowly whisk in the milk to make a thick smooth batter. Beat in the melted butter, and stir in half the blueberries. Meanwhile cook the bacon until slightly crispy. Use a pan on the hob for best results, but grilling is fine too. Next heat a teaspoon of oil or small knob of butter in a large frying pan over a medium heat. For each pancake, take around a tablespoon of the batter and drop add neatly to the pan. Each pancake should be around 7cm in diameter. Make three or four pancakes at a time. Cook for about 3 minutes until small bubbles appear on the surface of each pancake, then turn and cook another 2-3 minutes until golden. Cover with kitchen paper to keep warm while you use up the rest of the batter. 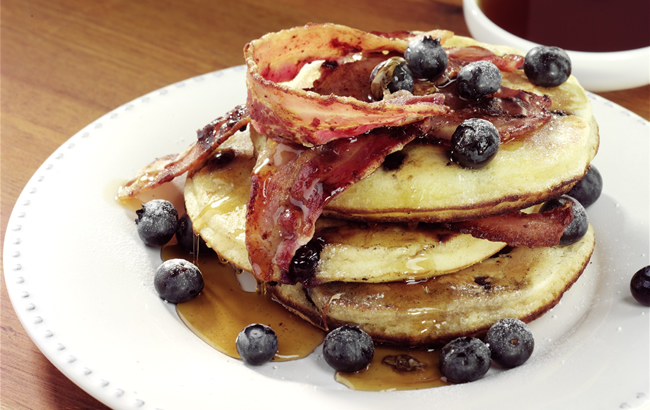 Stack the pancakes and place the bacon on top. Drizzle with maple syrup and scatter the blueberries over just before serving.